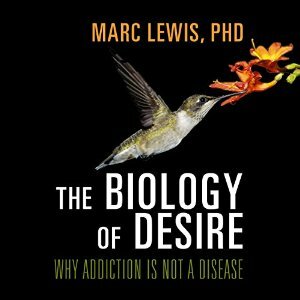 Neuroscientist and former addict Marc Lewis writes an engaging study of the biological changes that occur in an addicted brain, complete with personal stories about himself and several addicts that he interviewed. Lewis points out that there are two major models for addiction – the disease model and the choice model – and argues why he believes the disease model has outlived its use and is now harming rather than helping addicts. The disease model of addiction is highly accepted by clinicians, psychologists, and insurance companies right now. It posits that the more an addict uses a substance, the more his brain changes, and the more he needs the drug. Furthermore, some people have a biological preinclination for addiction – it doesn’t mean that they will become addicts, but the genetic preinclination raises their chance of becoming an addict under the right environmental stimulus. The combination of genetic factors and changes in the brain suggest to clinicians that addiction is a disease. A lot of money, therapy, and medication currently goes into treating addiction as a disease – often successfully. Lewis argues, though, that changes in the brain and genetic preinclination do-not-a-disease-make. After all, every experience changes your brain – and some events, like falling in love, change your brain in much the same way addiction changes it. Furthermore, much as people have a preinclination for addiction, they also have a preinclination to temperament. For instance, an introverted, agreeable parent is more likely to have an introverted, agreeable child. Despite this heritability, temperament is not considered a disease. So why do we pick-and-choose which heritable brain-changing habits are a disease? My answer is that addiction is considered a disease whereas in-love and temperament are not considered diseases because in-love and temperament do not generally cause clinically significant impairment in an individual’s ability to function in the workplace and social interactions. And when they do inhibit the individual’s ability to function, then they are considered a disease. Instead of the disease model, Lewis supports the “choice” model. People choose to abuse substances in the first place, and continue to make that choice. And when they give up the substance abuse, it is generally because they have chosen that now is the right time to give it up. Lewis spends the great part of this book describing why he feels viewing addiction as a disease is harmful to addicts as well as unhelpful for treatment. When an addict views his problem as a disease, then he might feel helpless to make his situation better. Whereas if he views it as a choice, he recognizes that he has power over this problem. You might notice that this is in stark contrast to the first step of AA in which the addict accepts that he is powerless over his addiction. In fact, in the stories of Lewis’ interviewees, none of them mentioned AA or NA as a helpful tool for stopping their addiction. Lewis also points out that although medication and therapy generally help the individual to give up alcohol to begin with, there is a very high relapse rate. And that is because although the individual doesn’t want the negative effects of his addiction, he has not yet accepted the choice to give up the drug. This book has been on my radar for a while as I have been thinking of reading it. I really like the idea that the disease model and the choice model not being mutually exclusive. It makes perfect sense that they are just different ways of looking at the problem. Each can be helpful. Yeah, I'm glad he doesn't think they are mutually exclusive, because I think there are great benefits to both models. And those benefits might differ from addict to addict. I know there are a lot of addicts that are insulted by the choice model. This sounds like a fascinating read and I always appreciate when authors of science nonfiction are able to recognize nuanced situations where other people might see an either/or.